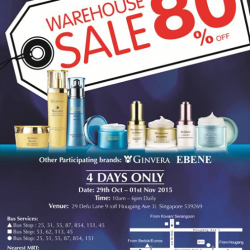 Bio-essence's BIGGEST WAREHOUSE SALE IS BACK! 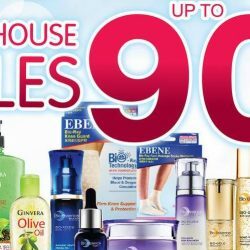 Enjoy up to 90% OFF Bio-essence Singapore, EBENE Singapore & Ginvera Singapore Skincare & joint care products! What are you waiting for? See you there! 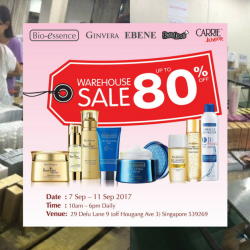 Bio-essence Warehouse Sale is back! Happening from 30 August to 3 September 2018, enjoy up to 80% off Bio-essence, Ebene and Ginvera products for 5 days! Plus get $8 product voucher with purchase of $88 or $28 product voucher with purchase of $188! 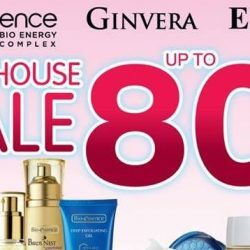 Enjoy great savings of up to 80% off at Bio-essence Warehouse Sale for only 5 days, so grab your friends and head down now to lay your hands on your favourite Bio-essence, Ginvera and Ebene products at a discounted price! Also enjoy up to additional $28 product voucher with min. spend! 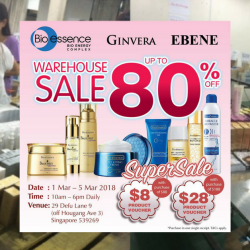 Enjoy great savings of up to 80% off at Bio-essence Warehouse Sale for only 5 days, so grab your friends and head down now to lay your hands on your favourite products at a discounted price! Also remember to check out the mini baby fair with discounts up to 50% off! Do you know that there is a symptom called Smartphone Face? This describes the sagging of jowls and chins due to constant bending of head to use technology devices such as smartphones and tablets. With the increasing use of mobile devices, this symptom is becoming increasingly common. Now you can counter this by trying Bio-essence’s famed product, the Face Lifting Cream which contains ingredients to help you fight signs of ageing and lift and firm sagging skin. Head down to Bio-essence Warehouse Sale from 17th to 21st March 2016 to enjoy up to 80% off selected items! You can also get discounts on Ginvera and Ebene products! Start the day right with your favourite Bio-essence Facial Cleanser. Grab your favourite now with Buy 5 Free 1 promotion exclusively on Qoo10. While stocks last! Now you can counter this by trying Bio-essence’s famed product, the Face Lifting Cream which contains ingredients to help you fight signs of ageing and lift and firm sagging skin. Head down to Bio-essence Warehouse Sale from 7th to 11th January 2016 to enjoy up to 80% off selected items! You can also get discounts on Ginvera and Ebene products! 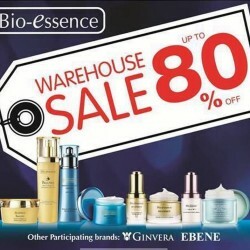 Come and enjoy Bio-essence Warehouse Sale and save up to 80% OFF, the bigger and better. Come on down to join them and grab your favourite essentials from today onwards. We will be here from 10AM to 6PM, from 29th Oct till 1st November. See you there. 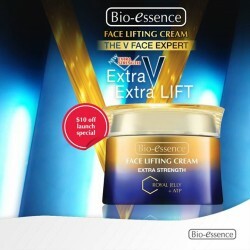 Come and enjoy this bio- essence $10 off for face lifting cream only at watsons . so come and hurry grab your at the nearest watsons store nation wide. Let your skin glow like gold. Royal Treat for Luminous, Radiant Skin. 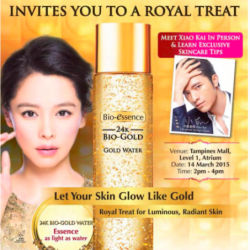 Tampines Mall offers Bio Essence Road Show Special this 14 March 2015. Buy more to save more! Enjoy 25% + 10% off when you buy at least two Bio-essence products! Offer is only valid at Watsons from now till 2 Apr. You don’t want to miss this! For 3 days only. 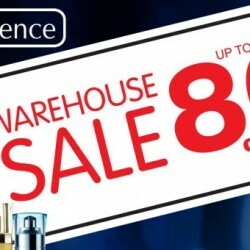 Warehouse sale up to 80% off by Bio-essence! Also featuring Ginvera and Ebene beauty care products. Singapore is turning 49 years old this year! 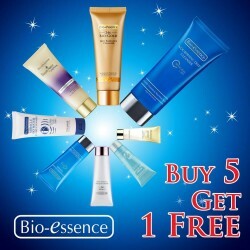 Bio-essence is having a special promotion his month! 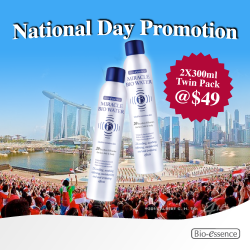 Enjoy 2 sets of 300ml Miracle Bio Water Twinpack(2X2) @ $49 only! 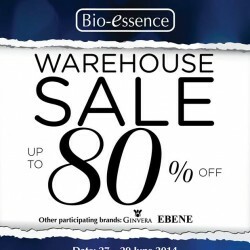 Shop Bio-essence, GINVERA, EBENE and more at Bio-essence's up to 80% off warehouse sale this weekend(27-29 Jun. 2014). Location: 29 Defy Lane 9 (off Hougang Ave. 3) Singapore 539269.